Those seeking entrance to the Kingdom need to be like Christ in spirit, attitudes, and behaviors; that is, holy, loving, kind, patient, and in obedience to the Father with all that implies. They need to exhibit the fruits of the Holy Spirit. 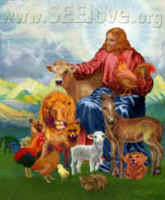 They need to grow above sin and carnality, and to love and care for all of creation. They have grown to maturity spiritually, whatever their chronological age might be. Moreover, whether after bodily death or alive on present-day earth, Heaven’s citizens need to possess spirits and personalities which are capable of true unity, or oneness with God and with one another. “My prayer for all of them is that they will be of one heart and mind, just as you and I are, Father…” (John 17-21) This oneness is of a certain type. It is a faithful, consistent relating, or harmony, what is without fear, “walls,” or “barriers.” Although interpersonal boundaries may seem blurred, or meshed, individual identity is neither threatened nor lost. Persons are truly open to the easy flowing of the Holy spirit through them. Each of the participants in interpersonal relationships allow the other to know him or her as in the “I-Thou” relationship described by theologian Martin Buber. No guile or pretense is present either with God or one another. Harmony in thoughts, communications, and actions is predominant, as the phrase “interactional synchrony” would describe. Life is lived in a “flowing together” manner. Humans are committed, honest, loyal, faithful, and loving. Christians consistently “lay down their lives for one another,” not only in times of crisis, but routinely, only too glad to promote the well being of their loved ones. Human and animal family members are not ignored, but are loved and nurtured as much as possible. Persons in the community are treated with friendliness, courtesy, and respect. Christians continually seek to feel God’s presence and to follow Him. Therefore, Christians who successfully seek and obtain the Kingdom of Heaven share some absolutely essential characteristics, at lease to at some critical level of development necessary for Kingdom participation. Without these characteristics, the true unity and love necessary for Kingdom living is not possible. As an example of a necessary ingredient, mutual trust is mandatory for true openness to be possible and successful. Only a foolish person would knowingly open him or herself up to someone with ulterior, less than holy motives. Kingdom citizens need to be absolutely trustworthy, to God and to one another.